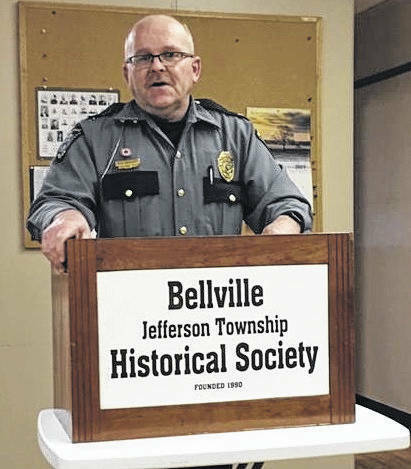 BELLVILLE — Bellville Police Chief Ron Willey was the March speaker at the Bellville Jefferson Township Historical Society. Ron introduced himself as a 1984 Clear Fork High School graduate who initially showed interest in law enforcement when he joined the young cadets at age 13 under Steve Frances, former Bellville police chief. In 1985 he began serving part time on the Bellville police force and in 1998 became full time employee under Chief Cooner. Altogether Chief Willey has served 33 years on the police force. Serving “old Bellville” plus the new corporation limits past Loves truck stop on Rt. 97 past I-71, the Bellville police department logged 94,105 miles answering 2,672 calls last year. Bellville officers responded to 91 traffic accidents in 2018. Bellville school has an officer in the building when school is in session. The number of calls here in Bellville were 1701; 718 calls were to the Rt 97- I71 area. The Avita area will continue to develop and the Bellville police force will expand appropriately,hopefully adding a sixth full time officer along with our current five part time officers. The force is also looking for volunteers and auxiliary officers. As for the Bellville community, theft, fraud, and drugs are the primary problems. Anything Mansfield fights can find its way to Bellville and does. Black market prescription drugs will bring $30-$40 a pill. Heroin is readily available and lethal doses of fentanyl are so prevalent that police officers must wear gloves and carry antidotes. Willey also explained that the Bellville Police Department will never call you to donate money. However the Richland County Fraternal Order of Police collects to donate to Bellville’s Safety Town, among other projects. Questioned about the human trafficking problems, Chief Willey said that Ohio is one of the main states with high numbers of humans trafficked. The department is being trained to know what to look for and how to handle cases of human trafficking. Part of that training involved conversations with two 17- year-old victims of human trafficking. Among local non-criminal services, the police department will check your house if you plan to be away for a period of time. They are also available for Neighborhood Watch meetings. Chief Willey and the Historical Society would like to know more of the history of the Bellville Police Department. Who were the past chiefs? When was the police force initiated? If you have knowledge or written history, please contact Chief Willey at the department 419-886-2813 or come to the museum any Wednesday afternoon. The next historical society membership meeting is at 7 p.m. April 15 in the community room of the museum. Janice Wycoff, superintendent of Clear Fork schools will be our speaker. Every one is welcome. Courtesy photo Bellville police chief speaks to Bellville Jefferson Township Historical Society. https://www.thebellvillestar.com/wp-content/uploads/sites/39/2019/03/web1_Ron-Willey-cropped.jpgCourtesy photo Bellville police chief speaks to Bellville Jefferson Township Historical Society.